Run a Fluke iFlex™ Flexible Current Probe around a single conductor. Or, you can center the jaws of a clamp meter around a single conductor. This is a false belief among some who select and install motors. Properly sizing motors for a given load results in driving loads more efficiently, saving energy, and saving dollars. Motors typically are most efficient when they are 90 % to 95 % loaded. Just because a motor says "25 Hp" on the nameplate does not mean the motor is producing twenty-five horsepower as it operates. The motor may be producing quite a bit less depending on the load requirements. If the motor constantly runs at these reduced horsepower requirements money is being wasted and you should consider replacing it with a correctly sized motor. Additionally, sizing of conductors and the fuses or circuit breaker supplying that motor are based upon the full load current rating of the motor, how often it is expected to operate, and other factors. 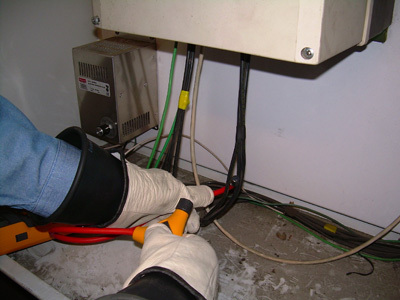 Installing larger conductors and breakers than needed is a wasted expense. It is also important to realize that even at low horsepower requirements a motor still draws a relatively large amount of current. For example, a motor operating under no load at all still draws about 50 % of its rated current. When replacing motors it is important to match the motor to the job. In addition to selecting the proper voltage, phase (three phase or single phase), design letter, and code letter, be sure to select the proper horsepower rating. If the motor has been replaced previously, or is running a pump, fan, or other equipment that was not sized as part of an entire system by the OEM, you may not be selecting the right size motor. Taking some basic voltage and current readings to estimate your own horsepower requirements will provide you with a more efficient system. Such information is valuable when conducting an energy study. If the motor load varies 90 % or less from full load for extensive amounts of time, the application may be right for a variable speed drive and, thus, significant savings. For instance, if motor horsepower requirements can be reduced with a variable speed drive to decrease motor speed to 90 % of the motor's full rated speed, then energy consumption is reduced to 73 % of what is required for full-speed operation. Just another reason to know the load requirements of your equipment! In some cases the motor may be overloaded, drawing more than its rated current. Whether it is bad bearings, a misaligned shaft or other maintenance issues, or just excessive load on the motor, one detrimental effect is occurring for sure: excessive heat is being produced in the windings. Heat deteriorates insulation and is the leading cause of motor failure. While properly sized and installed overloads will trip the motor at typically 115 % to 125 % of the full load current value on the nameplate, the heat developed during this time is sure to shorten motor life. Example: How much horsepower is a 25 hp motor producing at 472 volts and drawing an average of 20 amps per phase with a motor nameplate marking of 90 % efficiency? The quickest method to closely estimate motor horsepower is to use a digital clamp meter to measure current and voltage to the motor, and then perform a simple calculation. Use this formula to estimate motor horsepower. Horsepower(hp)= Voltage x Amperage x % EFF x power factor x 1.73/746. Be sure to follow the safe work practices appropriate to the specific application. 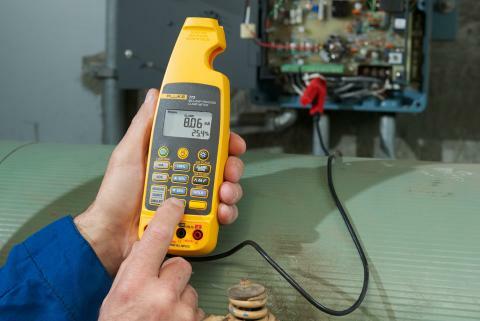 With the availability of remote display digital multimeters, such as the Fluke 381 Remote Display True RMS Clamp Meter, workers can reduce their exposure to lethal voltages and the arc-flash hazard zone. You also need to record operating values of loads other than motors. Since horsepower is not determined for loads other than motors, simply use the procedure outlined in the sidebar "Use this formula to estimate motor horsepower" to measure and record the current value to the load. Examples of such loads might be hermetic refrigerant motor-compressors found in HVAC equipment, lighting loads, and heating elements. Rated-load current on hermetic refrigerant compressors and current ratings on other types of equipment need to be compared to measured values when you are dealing with breaker trips or overheating of equipment. To determine the size of breaker and conductors needed to supply your load, refer to the National Electrical Code® (NEC®), manufacturer's instructions, drawings, and any local code requirements. Though the NEC has specific rules for various types of equipment, such as motors and HVAC equipment, generally conductors and circuit breakers are sized at 125 % of the continuous load plus 100 % of the non-continuous load. The iFlex™ probe surrounds a single conductor in this drive cabinet for an air handler unit (AHU). 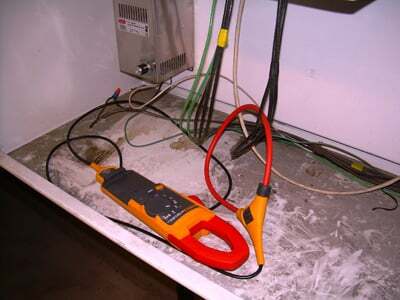 The Fluke 381 Clamp Meter is used to record the amperage reading to troubleshoot a suspected drive problem. The same clamp meter is used to estimate the horsepower produced by a motor. A "continuous load" is one where the maximum current is expected to continue for three hours or more. One important point: when sizing conductors and breakers for motors use the appropriate table in the NEC for motor full-load amperage—not the value previously measured or motor nameplate information. The value previously measured is for helping to determine the size of the load. Sizing wires and breakers to supply a motor is based on code tables providing the full-load current values for specific phase, voltage, and horsepower motors. Manufacturer's ratings and measured values are used for other than motor loads. For example, a three-phase, 25 horsepower chilled water pump motor is expected to operate at full load for three hours or more. The NEC tables indicate that the full load current of a three-phase, 460 volt, 25 horsepower motor is 34 amps. Therefore, the conductors supplying the motor must be sized at 34 x 1.25 = 43A (125 % of 34 amps). 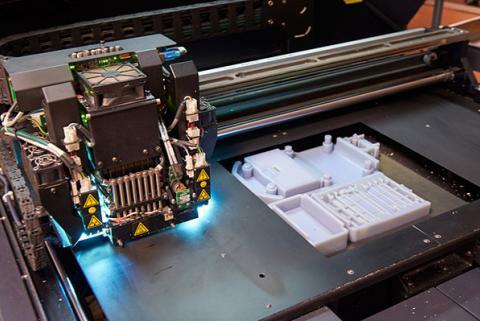 Ampacity tables in the NEC are used to determine the actual conductor size based on insulation type, ambient temperatures, and other conditions. The maximum circuit breaker or fuse size for the motor is based on another NEC table, Table 430.52. The maximum value of this overcurrent protective device may range anywhere from 175 % to 250 % of the full load current. 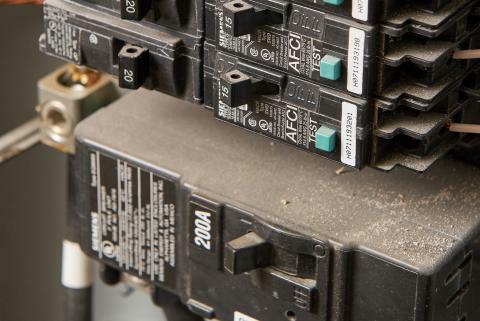 Always consult the National Electrical Code or a qualified electrician for exact sizes for motor wiring, fuses, and circuit breakers, as well as the overload protection requirements for motors. The same holds true for hermetic refrigerant motor-compressors and other types of electrical equipment. You must determine motor horsepower in the field to verify that the right-size motor has been applied. If the motor is oversized, consider replacing the motor or installing a variable-speed drive. Routinely measuring and recording current and voltage values is also an important part of a quality preventive maintenance program. Size the wiring and breakers for any type of load using the National Electrical Code. 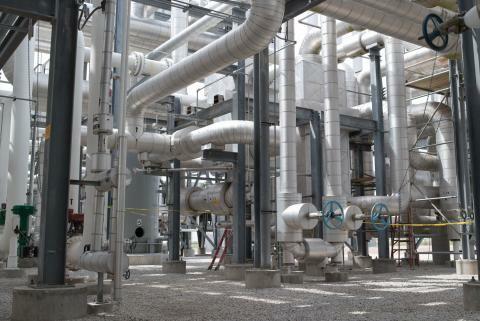 Remember, the goal is a properly sized and safe installation operating at maximum efficiency.